THE second annual Oceana Grant A Wish Pink and Blue Ball was a roaring success, smashing last year’s figure to raise €16,000 for some exceptional causes. It was only the second time the ball has been held and organisers are delighted to have beaten the €12,500 collected in 2017, which in itself was a record for a single fundraising event for the charity. Speaking about the event Jody Smart who organised the event with Franco Pearson, said: “We are blown away, emotional, proud and just so deeply grateful to each and everyone who helped us make it happen. “It takes months and months to pull together something so special and incredible! It was our second annual Pink and Blue ball and we surpassed our target of €15,000, which was just great. We feel blessed to have so many people willing to help the charity”. The event, held at the Oceana Club in Bennisa was, just like last year, a sellout, with 65 guests for the afternoon dinner and 150 making the evening ball one of the social highlights of the year. Eros Yanni brought his own brand of magic to the event, going from table to table to astound the guests with his sleight of hand. 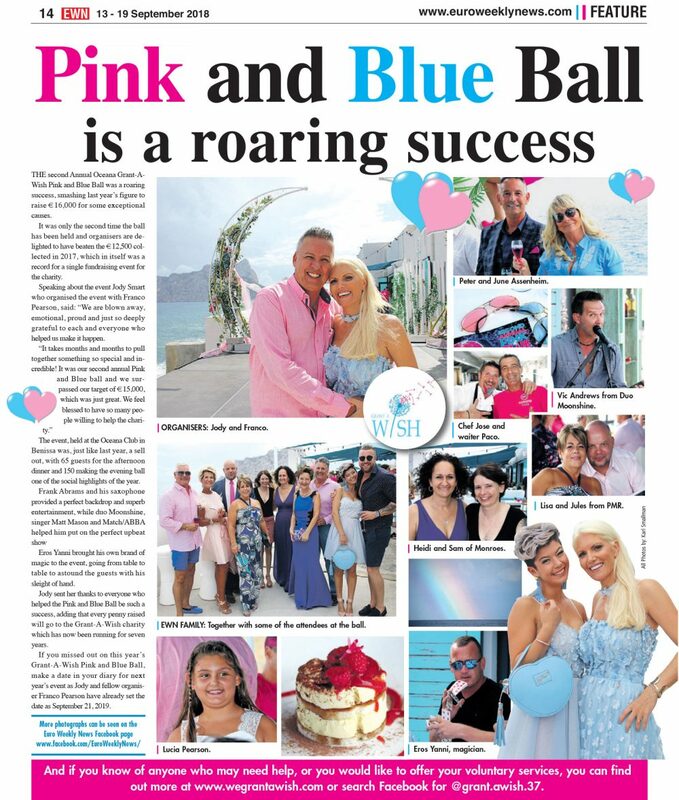 Jody sent her thanks to everyone who helped the Pink and Blue Ball be such a success, adding that every penny raised will go to the Grant A Wish charity that has now been running for seven years. If you missed out on this year’s Grant A Wish Pink and Blue Ball, make a date in your diary for September 21, 2019. Jody and fellow organiser Franco Pearson have already set the date for next year’s edition. And if you know of anyone who may need help, or you would like to offer your voluntary services, you can find out more at www.wegrantawish.com or on Facebook.